The artist supports Andrew Jackson's decision to withdraw federal funds from the Bank of the United States and distribute them among various state banks. Henry Clay and Bank president Nicholas Biddle's efforts to oppose Jackson's measures are lampooned. Several figures look on and comment as a horse-drawn, covered wagon pulls away from a warehouse and adjacent United States Hotel. In the center below stand Andrew Jackson (holding a coachman's whip) and Uncle Sam. Jackson: "Why Uncle Sam I consider that Store House not safe. as I observe, a number of Rat-holes. and also, they keep a nest of gamblers in the Hotel, so I thought it best to take your produce to another Store House." Uncle Sam: "Well Andrew, I think you do what is best for my interest. Farmer York speaks well of what you are doing. dont mind those barking fellows I will stand by you." 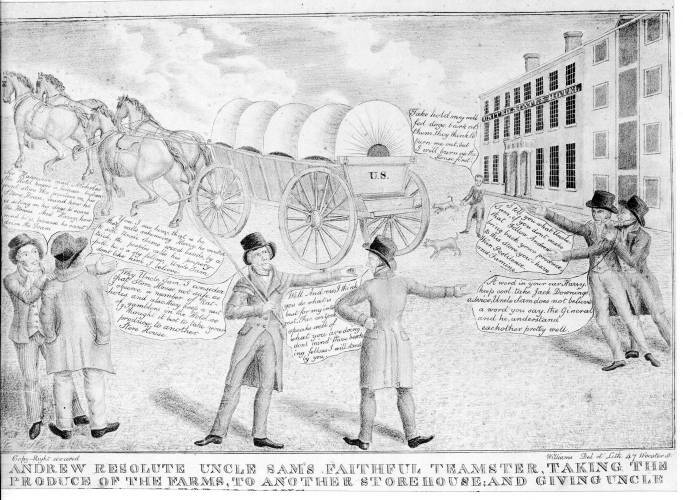 Uncle Sam gestures toward two men on the left, Henry Clay and Jack Downing. Clay (gesticulating wildly): "I tell you what Uncle Sam, if you dont make that Fellow Andrew bring back your produce, to this Store, you'll have War. Pestilence, and Famine." Downing (restraining him): "A word in your ear Harry. keep cool. take Jack Downings advice, Uncle Sam does not believe a word you say. the Gineral and he, understand each other pretty well." Beyond them stands Bank president Nicholas Biddle, who urges on two dogs, saying: "Take hold, my well fed dogs, bark at them, they think to turn me out, but I will burn up the House first." His comment refers to his vengeful attempt to cause a bank crisis during the winter of 1833-34 by artificially tightening credit. At lower left two men look on and comment. The first says, "See Hance, how mad Nicholas the Hotel keeper is, because Andrew wont store the produce in his Store House, mid how he is seting [sic] on his dogs to scare the Horses. And Harry, how mad he is, because he cant drive the Team." The second, "Yaw. I sees him, that is he they calls schemeing Harry. he wonted to sell Uncle Sams wood lands, by a trick, the peoples calls his pripery-pill. he is a sly fellow, Uncle Sam dont like him I believe."